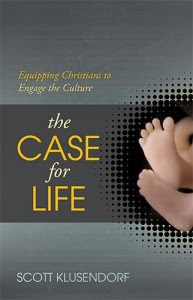 The Case for Life: Equipping Christians to Engage the Culture is a book I wanted to read but didn't really necessarily want to review. To be extremely blunt, it is very wearisome to feel like one is constantly running up against the culture time and time again. (Can I get an "AMEN!"?) Then again, maybe it's just me. Despite the fact that I have a very black and white personality and like to clearly divide between good and evil, I also harbor a dislike of "rocking the boat", shall we say? Rocking the boat is not a very fun activity. People yell at you. Being yelled at isn't something I really consider to be a fun activity and I don't usually revel in it. So yes, if you know me very well at all you know that my beliefs are deeply ingrained and eventually they are going to come out and make an appearance. Even then though, I shudder. I'm just being honest here. I have a love/hate relationship with conflict and that's the bare bones truth of the matter. Enter: The Case for Life which is a new book that has just been released by Crossway Books. (For the record, I think Crossway Books consistently publishes solid material and I love supporting them in whatever way that I can. I admire their desire to publish solid reading material.) I knew this book was going to be good - even GREAT! I also knew that it was going to be difficult. Murder isn't exactly an easy subject. I am pro-life. If you ask me in person, I won't hesitate to say so. I will hesitate to put this down in writing - into words that can then be dealt with according to the three M's: Mutilation, misunderstanding and manipulation. In short, honestly, I am a coward when it comes to putting my deepest thoughts into actual WORDS that cannot easily be taken back. That's the plain truth minus the coat of honey. This book is fabulous though so I'm gonna "talk" to you about it. It is a great resource for people who are pro-life but don't really know how to engage the culture or explain to people why they feel the way that they do about it. It doesn't promote anger, bitterness or strife. On the contrary, it promotes logical, calm and reasoned discussion. Nevertheless, it also unabashedly stands up for the rights of the unborn, who are humans and should be defended as such. No apologies made. Author Scott Klusendorf does talk about the fact that the pro-life movement is not going to survive unless Christians (specifically) take a stand against the abortion movement. He talks about the struggle of running a pro-life movement with privately funded programs and part-time volunteers. In contrast, you can take a glance at NOW or other pro-choice movements who have plenty of monetary backing (federal backing even). That's what we're up against. But my black and white mind says no matter how we look as pro-lifers - no matter how much of a ragtag or motley crew we are, truth wins in the end. We must keep talking about the rights of the unborn no matter how much we are or are not paid to do so. It is a matter of glory and honor and not necessarily our own. As Klusendorf points out, it is not an argument about who is right and who is wrong as much as it is a question of IS the unborn a human or no? If it isn't, then there is a logical conclusion to be drawn. If it is a human though, then we have a duty and a responsibility to protect that life from being murdered. There is a basic and natural call upon humanity to guard the sanctity of life. In this book he offers his own arguments and helps guide you, the reader, to coming to a logical conclusion of your own. I found this book to be very helpful. Maybe you don't have the same struggles as I do to protect your core beliefs from ridicule and if so, more power to you! It used to be easier for me to "spill my guts" but then I realized how angry others can get over the thoughts that go on in MY head and I have opted to be silent more times than I should have. This book is definitely written for pro-lifers and no matter where you stand on this journey, whether you are happy to quietly and calmly protest (in a calm, orderly and LAWFUL manner) or you work at a crisis pregnancy center or you are adopting a child who was given the gift of life, this book is helpful in answering your own questions and raising some regarding your own personal responsibility on the matter of protecting human life. The answers you might find in this book might not be easy but sometimes easy is too much to ask or hope for. Sometimes determined obedience is the only answer that there is. This blog post isn't complete obedience but it is a start. For me. Another great book I read on the topic of abortion is You're Not Alone : Healing Through God's Grace After an Abortion which I read and reviewed over at 5 Minutes for Books. I highly recommend that one also, regardless of whether or not you've ever had an abortion or not. It's a good book for anyone to have read. The film subject revovles around Patrick Henry College and their Moot Court team which is involved in a national competition. The lead character in the film is young Caleb Hogan who wants to attend PHC, against the wishes of his high-powered attorney mother, because they have the best debate team in the nation. He starts out on his quest for a top education and ends up debating the issue of when life truly begins. Of course there is a love interest, a tense marital relationship, hard work and strong words mixed in. This is the first film produced by Advent Film Group and honestly that shows. However, I think they are definitely on the right track and the film has a message that I agree with quite strongly. I would advocate supporting this film so that more can be made which support similar themes and advocate family, truth and justice. This is another good resource for the pro-life movement and then it's just interesting for me to personally watch because I had a friend who went to PHC and so the scenery is familiar to me to some degree, having visited the campus and being connected with students and staff alike. You might want to check this one out! So now here's my bold and honest post. I don't expect everyone who reads this post will agree with me and, you know what?, that's ok right now. No need to leave a string of nasty comments. I'm not there with you on that. You are welcome to disagree with me but my opinion will remain the same. My two cents. "To be extremely blunt, it is very wearisome to feel like one is constantly running up against the culture time and time again." Thank you for this book review. I haven't read it, but it almost sounds like apologetics for this particular topic. I am glad to see that you pointed out the well-reasoned, logical tone of the book. That's impressive to me. I will definitely put this book on my "to read" list. Thank you for an excellent review, which sounds as if you took my thoughts and put them down in print. ;) I'll have to get this book! Thank you for taking time to read and review my book! You did a fantastic job capturing the spirit of what I was trying to communicate. I'm grateful. You get a big AMEN! from me and you could have taken the words right out of my mouth. It is very hard to rock the boat. I often don't post things on my blog that I want to but know will cause controversy, so I don't. So kudos to you for being brave and putting your beliefs out there. There are many of us who feel the same way you do. Peace be with you. Carrie, I just found this review. Wow, this was such a brave post! I think there are a lot of us out there who identify with what you have written. I would love to read this book one day.